August 7, 2012 (Cleveland, OH) – Vocalist Destini Beard has released A TIME FORGOTTEN, her first full-length album and followup to 2010’s successful THE DARK MASQUERADE EP. As with her previous release, the album showcases Destini’s lyrics and haunting, alluring vocal performances and arrangements blended with music from gothic horror music pioneers Midnight Syndicate. The theme of the album surrounds a once-thriving Victorian hotel which suffers a tragic fire and is now haunted by it’s past residents as well as a malevolent spirit that holds dominion over all of them. The story goes on to tell of a young woman who is called from the spirit world to the hotel to reunite with her departed true love only to discover the dark secrets that lie behind the rooms’ walls. 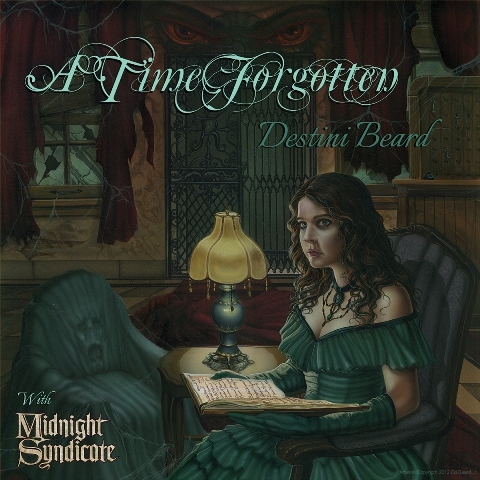 In addition to featuring twelve re-imaginations of classic Midnight Syndicate songs from CDs like THE 13TH HOUR, GATES OF DELIRIUM, and VAMPYRE, A TIME FORGOTTEN also features an industrial dance remix of FAREWELL FOREVER (NOCTEM AETERNUS) from Destini’s THE DARK MASQUERADE EP. The remix was produced by Pat Berdysz of the industrial band, Encoder whose credits include the DEAD AND BURIED REMIX of Midnight Syndicate’s GRAVEYARD on THE DEAD MATTER: ORIGINAL MOTION PICTURE SOUNDTRACK. The final special offering on this album, is the debut presentation of an original piece composed and performed by Destini Beard entitled MY LAST GOODBYE. The album also features an eight panel fold out, with all of the lyrics for the listener to read along with and fully immerse themselves into the storyline. The cover art has been created by fantasy illustrator Ed Beard Jr, and captures the essence of the lead character and the mysterious Victorian hotel. The CD is available now on Midnight Syndicate and Destini Beard’s websites, Amazon.com, and CDBaby. It will be available digitally on iTunes and Amazon MP3 on September 11, 2012. Destini is a lyrical soprano in the enchanted and haunted soundtrack world. Destini’s 3-4 octave voice has an emotive sound that mesmerizes all who listen to her. Destini’s debut EP The Dark Masquerade was a tremendous success with audiences worldwide. After performing across the U.S. and overseas, she returned to the studio once more to produce her follow up CD A Time Forgotten collaboration with Midnight Syndicate. Midnight Syndicate’s impact is most felt by the general public during the Halloween season. As the first band to devote themselves to producing high quality instrumental music for the Halloween retail, haunted attraction, and amusement park industries, Midnight Syndicate paved the way for other musical artists and revolutionized the way those industries view “Halloween music.” Venues that feature their music include AOL Radio, Sirius XM, Carnival Cruiselines, countless Halloween and party stores, the vast majority of independent haunted attractions worldwide, and every major theme park company in America, including Universal Studios, Anheuser Busch, Cedar Faire, and Six Flags. Their music has appeared on shows like The Ellen DeGeneres Show, Monday Night Football, the NBA on TNT, Travel Channel and SyFy. It has even been used as pre-show music by horror music legends the Misfits and King Diamond and appeared on recordings by seminal horrorcore artists Three Six Mafia, Twiztid, Black Lotus, and Insane Clown Posse. In 2003, Midnight Syndicate created the first official soundtrack to the classic roleplaying game Dungeons & Dragons. In 2005, The 13th Hour became the first CD to win the gaming industries top awards, the Origins Awards and the ENnies. Since then, their music has been licensed for use in online games such as Shadowbane and X-Box games like Baldur’s Gate 2. In 2010, Midnight Syndicate released The Dead Matter movie. A dark fantasy/horror film co-produced by Robert Kurtzman (producer of From Dusk Till Dawn) and starring Andrew Divoff and Tom Savini. The film was well received by press and fans alike and won several awards. Currently, it is enjoying screenings at conventions and festivals across the country. Their popular 2011 release, Carnival Arcane, won Best Horror CD from the Rondo Hatton Classic Horror Awards and earned the band a nomination in the upcoming 2012 ENnie Awards. Having just completed the score to the upcoming grindhouse thriller, Bunyan, production on Midnight Syndicate’s next CD is well underway with an estimated release date of late 2012 or early 2013. The new disc promises a classic horror theme inpired by the creatures and stories of early Univeral and Hammer horror films. This entry was posted in Music to Die For! and tagged A Time Forgotten, Midnight Syndicate, Press Release. Bookmark the permalink. ← The Dark Knight Rises: Mark Justice Movie Review!